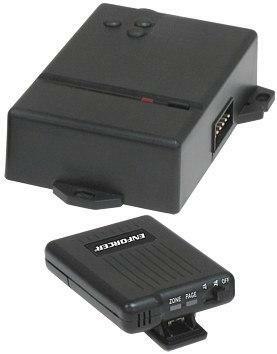 Monitors up to three zones per premises or vehicle, plus manual paging. Connect to nearly any type of burglar alarm control panel, vehicle alarm, communications panel, etc. One positive and two negative instant trigger inputs. Range: One half mile* (4W output). Over two million possible coding combinations. Code-learning receiver learns up to three transmitters. Color LEDs on the receiver indicate which zone (Green, Orange, or Red) of the premises or vehicle was triggered. Audible or vibration page indicator. EEPROM memory stores codes for up to one year without power. Stores the last six pages for easy recall. Extra vibrating receiver available (E-37RV). *Note: Antenna required. Antenna not included. 1 Actual range may vary depending on the environment, installation, and/or antenna.